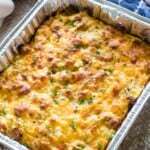 Your favorite breakfast casserole that you can make on the grill or in the oven! 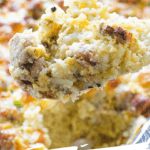 This quick and easy Sausage Breakfast Casserole is stuffed with hash browns, eggs, sausage and will be your new go to recipe for making a delicious grilled breakfast! 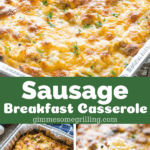 You know that casseroles can be made in the oven, but a sausage breakfast casserole made on the grill? You betcha! 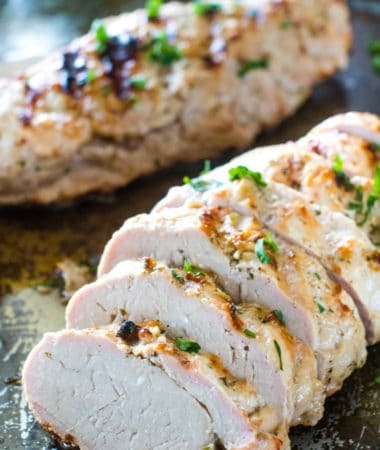 I know you’re going to love this meal! Stuffed with hash browns, eggs and sausage this is a great meal for breakfast, brunch or brinner! (You know, breakfast or dinner!) It’s really the perfect meal! I loved it, the hubs loved it and even the kids gobbled it up! How do you know when breakfast casserole is done? It will take about 45 minutes before this is completely done. You can tell when a breakfast casserole is ready when a knife inserted into the middle of the casserole comes out clean. If there are eggs and bits clinging to the sides of the knife, the casserole is not done. Close the grill and check in another five minutes or so. 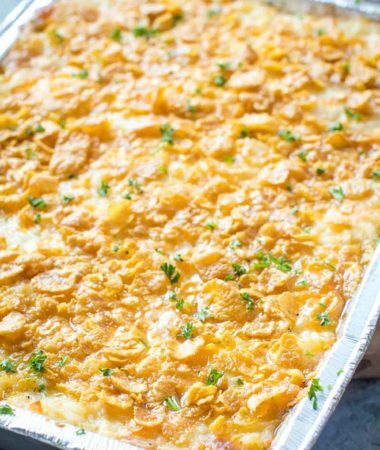 Do you bake a breakfast casserole covered or uncovered? 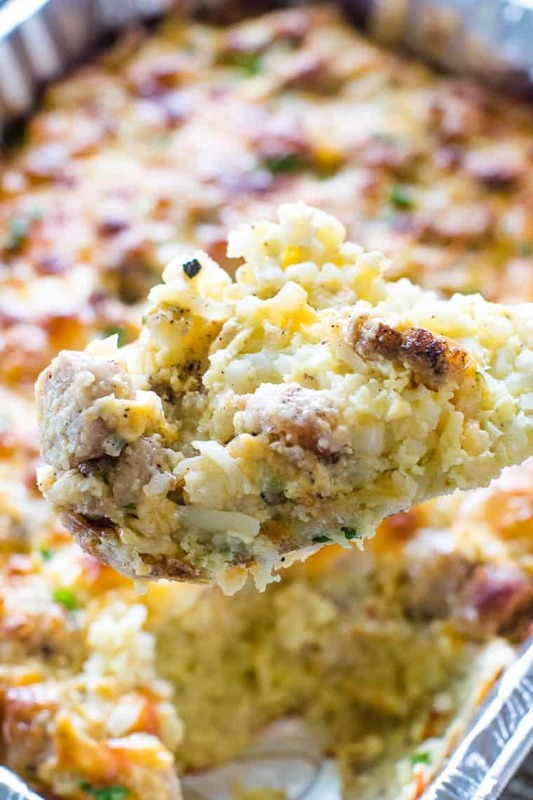 No need to cover this sausage and egg casserole. Put it on the grill over indirect heat and bake until it’s golden brown and the middle is set. 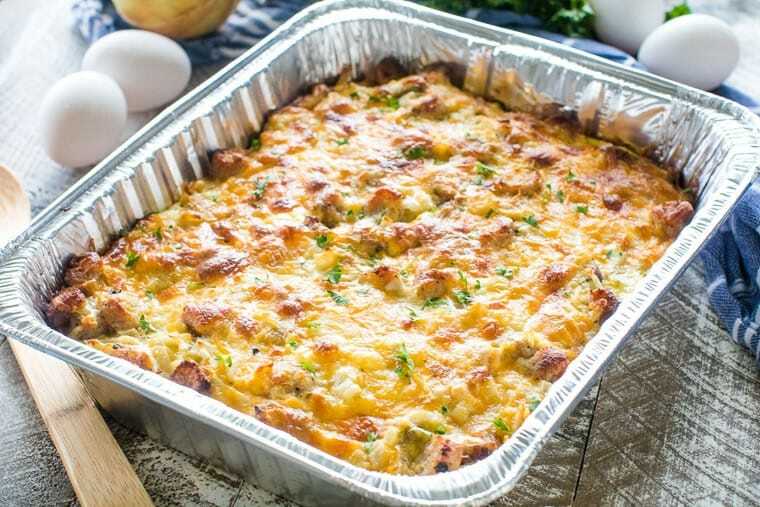 My oldest daughter LOVES breakfast casseroles so she’s always asking for one on the weekends. Jason actually invented this twist on it. I was feeling a little burnt out and I informed he was in charge of recipe development for the weekend and this is what he came up with. I’m pretty sure I retired at this point and I’m going to let him recipe develop every weekend because this breakfast casserole was AMAZING! 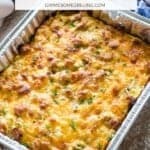 What can I serve with Sausage Egg Breakfast Casserole? Obviously I’m feeling my sweet tooth today, right? 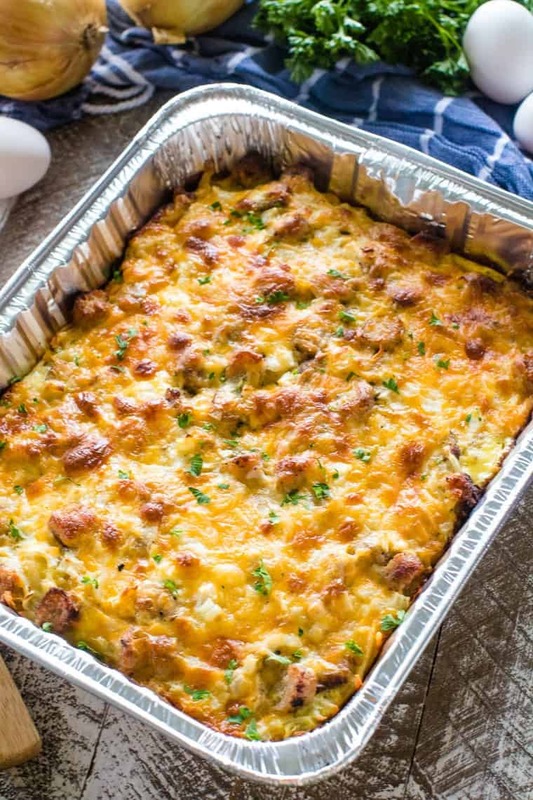 Well this Sausage and Egg Breakfast Casserole has it all. Serving alongside a little sweetness is the perfect balance! The BBQ Bloody Marye is perfect for the grownups! If you would like to prep this the night before you totally could. Just remember that since it starts in the fridge it’s at a colder temperature so it’s probably going to take about a hour to cook on the grill! Cook the sausage links on the grill until heated through. Spray a 9” x 13” tin pan with non-stick spray. Spread out hash browns on bottom of pan. Top with sausage pieces. Whisk together eggs, salt, pepper, 1 c. cheese, onions, and milk. Pour over sausage and hash browns. Top with remaining 1/2 c. of cheese. Grill over indirect heat for 45 minutes. 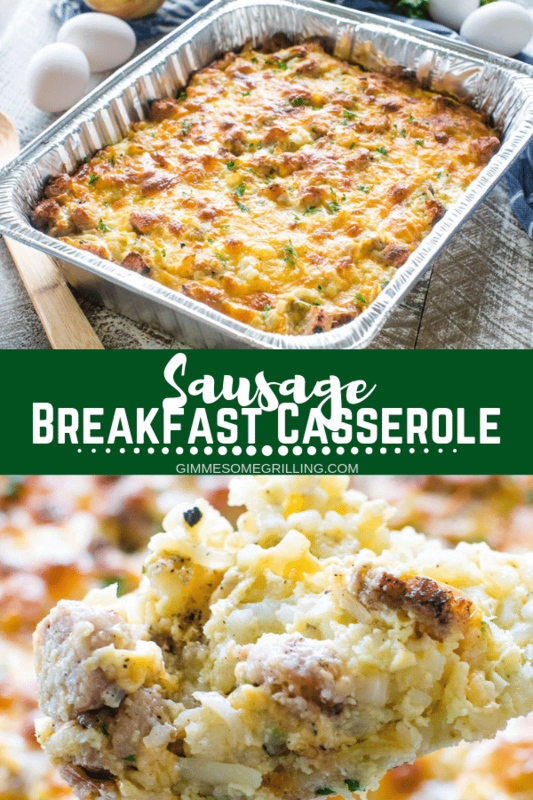 More delicious breakfast casseroles I know you’ll love! 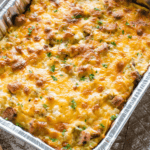 Your favorite breakfast casserole that you can make on the grill! 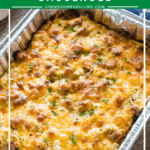 This quick and easy Sausage Egg Breakfast Casserole is stuffed with hash browns, eggs, sausage and will be your new go to recipe for making a delicious grilled breakfast! Grill sausage links on grill preheated to 350 degrees F for 10-15 minutes or until heated through. 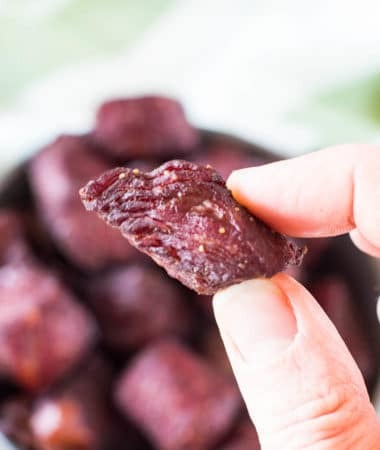 Remove from grill and chop into 1'' pieces. Spray a 9'' x 13'' tin pan with non-stick spray. Spread out hash browns on bottom of pan. Top with sausage pieces. In a bowl combine eggs, salt, pepper, 1 c. cheese, onions, and milk. Pour over sausage and hash browns. Top with remaining 1/2 c. of cheese. Grill over indirect heat at 350 degrees for 45 minutes or until middle is set. Cook sausage in skillet according to package directions. Prepare breakfast casserole according to directions. Bake in oven preheated to 350 degrees for 45-60 minutes or until middle is set. Love the use of the grill here and the all-in-one bkfst! Can’t go wrong with this for breakfast! Sounds like a very delicious breakfast! Perfect for weekends and feeding a crowd! It’s amazing for any reason! Love one-pan breakfasts and being able to do this on the grill is a great option! I love the idea of using the grill to make breakfast!! Thanks for the great recipe!! Such a great way to enjoy breakfast while you are camping or don’t want to heat up the house! Hi, don”t see where the recipe lists the number of eggs to use. 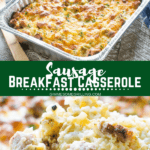 I LOVE breakfast casseroles! This one looks like a winner! It’s so delicious and full of flavor! Sounds great! How many eggs should be used? I didn’t make this on the grill, but in the oven and it was terrific! Enjoyed the leftovers for dinner Saturday night!